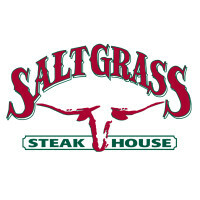 Saltgrass Steak House is an American chain of restaurants, owned by Landry’s, Inc. They specialize in many steak house classics live a variety of cuts of steaks, baby back ribs and other meat specialties. They are widely known for their quality of meats used in the restaurant. For more information about the Saltgrass Steak House application, follow the link below. Founded in March 1991, the first restaurant opened along the historic Katy Freeway (I-10) in Houston. The location was found along the historic train where cattle herders would drive their livestock south in order to graze on the salt grasses that are commonly found along the Texas Gulf Coast. The original restaurant remains there and is passed by riders annually before the opening of the Houston Livestock Show and Rodeo. Landry’s, Inc. purchased the Saltgrass Steak House in September 2002, which was previously a 24 hour chain. The company is headquartered out of the Uptown/Galleria Houston, Texas. There are more than 50 locations found within the United States, primarily located in the southern part of America. The owner of Landry’s, Inc. is Tilman J. Fertitta. Saltgrass Steak House careers can be found at both their restaurant and at the Landry’s, Inc. corporate office. This company is one that allows for growth and advancement within the ranks of this company. The restaurant has entry-level positions for people to get their foot in the door and move up the ranks of this company. Some positions include server, hostess, and line cook. Landry’s Inc. is the corporate office where corporate employees of this company will work at, though they make work as part of the Saltgrass subdivision. There are positions available for those of different education background and experience. Some positions at the corporate office include human resources, marketing, and restaurant operations. How old do you have to be to work at Saltgrass Steak House? You must be 18 in order to work here as a result of alcohol being served here, and the law requires a person must be older than 18 to serve it. Entry-level positions have little requirements other than age to work here. Other positions may require more. Saltgrass Steak House offers benefits similar to others in this industry. Employee eligibility can depend on hours worked weekly and job title. Some positions include health insurance, dental and vision plans. They can also have access to a 401(k) plan, meal discounts, and paid time off. They may also receive uniform reimbursement, career advancement, and paid training. The hours of operation can vary depending on location and holidays. Some holidays may cause closures for the entire day. For more information, contact your local restaurant for details. Generally, hours are Sunday through Thursday from 11:00am to 10:00pm, Friday from 11:00am to 11:00pm, and Saturday from 11:00am to 11:00pm. Server- The server is responsible for greeting customers at their table. They will take the customer’s drink and food order, taking care to note any allergies or special requests. The server is also responsible for ensuring that the order is correct before bringing it to their table. They will clean the table as needed and handle customer transactions. A server may earn around $3 per hour, not including tips. Host- The host is responsible for greeting customers upon entering the restaurant. They will maintain the wait list and the reservation list. When adding customers to the waiting list, the host should have an approximate wait time to give them. The host will answer the incoming phone calls into the restaurant, answering questions and taking reservations. A host may earn around $8 per hour. Bartender- The bartender is primarily responsible for serving drinks out to the customers. They will fill alcoholic beverages for the wait staff. The bartender will also take food orders from people sitting in the bar and serving them food. They will also ensure they are stocked of ice and glasses. A bartender may earn around $4 per hour, not including tips. General Manager- The general manager is responsible for a lot of the daily aspects of restaurant operations. They will conduct interviews and hire new employees and fire employees as it becomes necessary. They will ensure that their restaurant is properly stocked of inventory and are meeting sales goals. A general manager may earn around $67,000 a year. These are some questions that may be asked during your Saltgrass Steak House job interview. Why do you want to work at Saltgrass Steak House? This is a standard question at most interviews. The interviewer is wondering what attracts you to the company and why you feel like you fit in here. Why should we choose you over the other applicants? This is the chance to really sell your strengths and tell the interviewer why they would benefit from your addition to Saltgrass. What is your favorite menu item and why? The interviewer wants to see what, if anything, you know about the products that they offer. If you have eaten there before, discuss which items are your favorite choices. If you have not, you should consider looking over the menu to describe an item to them to show that you may not have eaten there, but that you prepared for your interview. When are you available to work? The interviewer is looking for an employee that is available for flexible hours, especially on nights and weekends. Be honest about when you are available to work. Have you ever had to work as part of a team to accomplish a goal? The restaurant industry requires employees to work together as a team in order to be successful. Describe any time that you may have had to work as part of a team to accomplish a task. Do you want to know how to apply at Saltgrass Steak House? You can apply for a Saltgrass Steak House job online at the Landry’s, Inc. website. You may also fill out an application form at your local restaurant. They do not offer printable applications online, nor do they have downloadable applications. The job descriptions and responsibilities are not listed on the website for available positions. You must fill out your application form in order to be considered for the position. It is also advisable to submit an updated resume with your application. This can be very helpful to getting the interviewer to choose you for an interview. Most applicants hear back from the company after a couple of weeks. If you do not hear from them after this time, you should contact them to see if they are still hiring for that position. If they are, be sure to check the status of the application. This helps them know that you are interested in working here. Preparing for your job interview can really make a difference in the success of your interview. Ask yourself possible interview questions out loud in front of the mirror. This can help you both practice the interview questions and your body movements to be sure that you exude confidence. Dressing professionally will also have a positive impact on your interview. Red Robin: Use the Red Robin job application to apply here. Pappadeaux Seafood Kitchen: See our guide for careers at Pappadeaux Seafood Kitchen. Grand Lux Cafe: See our guide for careers at Grand Lux Cafe. Ruth’s Chris Steak House: See our resource page for more information on Ruth’s Chris Steak House careers. Sizzler: See our guide for careers at Sizzler.